In the days when the school really did not have money, we had to swallow our pride and beg for whatever little favours those with kindred souls were willing to grant us. Yes, even a fully-depreciated and half worn-out bus that the owner probably had no further use for. It was 1996 and the Brother Rafael Donato was onto his second year as President of the school. His if-you-build-it-they-will-come philosophy was shifting into full gear; the SENTRUM was this colossal structure at which people could gape from the highway. The Diokno – then called the MTDC Building – was also under construction. 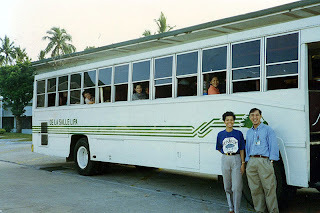 Brother Rafael thought that any self-respecting school ought to have a bus, one with the name of the school painted on it for all on the road to see. But he had to take on these massive loans just to have his dream buildings put up; and we were just getting by. He had to go begging. This Brother Rafael was excellent at. There were those – albeit behind his back – who would tongue-in-cheek refer to him as Brother Rafael Donation. He so loved to tell this story of how he practically played hide-and-seek with his good friend Dolly Potenciano – erstwhile owner of the now-defunct BLTBCo bus line – until he finally caught up with her in her home in San Pablo City. Cornered – and with her arm twisted for all intents and purposes – Potenciano agreed to donate one old bus to the school. The bus we were to receive was this old warrior that belonged to the company’s wide-body 400-series. It sat six across with a narrow aisle in the middle. It was fully air-conditioned if the weather was fine and the windows could all be opened. Brother Rafael had the bus painted white with green stripes on the outside that ran along the length of its body. Because Brother Rafael was fascinated with horses, there was also the head of a stallion painted next to the bus’ front door. Who else but Brother Rafael would think of a commissioning ceremony for a rickety old bus? That was to make the donors feel good, he would explain; so they would feel good about giving again. To be fair, the old warrior – the bus, not Brother Rafael – served us in more ways than anyone would have thought possible of a second-hand bus. 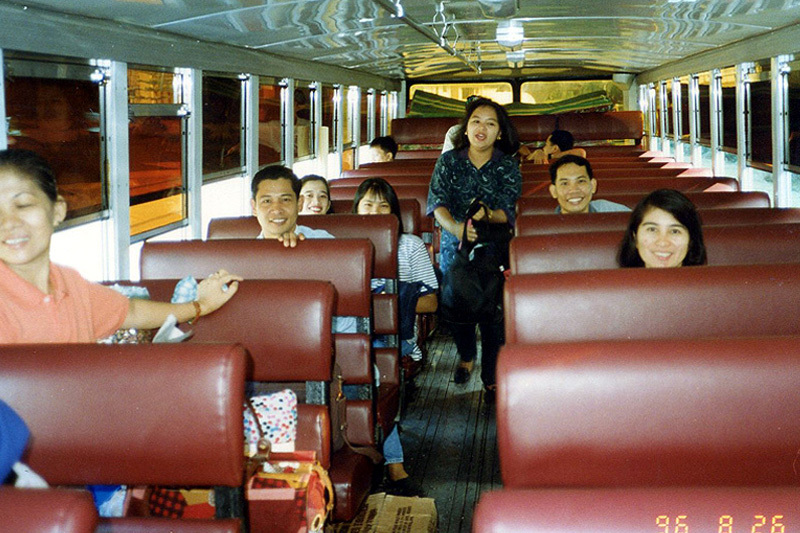 In one of the bus’ initial runs, a whole party of us administrators rode in it to Tagaytay for a mid-year workshop. We took the Sta. Rosa route which – at the time – was still under construction in large sections. For all its shortcomings, the bus traveled to the most unlikely and seemingly unthinkable destinations. For instance, it went on a faculty trip all the way to Legazpi and unlikely as it must have seemed at the time, it actually got to the top of the Mayon Volcano! Another time, it went on another faculty trip in the opposite direction to Laoag. The old warrior had guts; albeit, not necessarily reliability. My fondest memories of the bus are of the times when it brought my boys and I to and from weekend football matches. In all honesty, the boys loved it when we had the bus all to ourselves. Even when I was bringing two teams to a venue, it was still no more than thirty adolescent passengers in a bus that could seat about seventy or so. It goes without saying that we had more space when I was travelling with only one team. Because we invariably left school early for these matches – and some of the boys had to get up at dawn just to be in school for departure – then the boys had the luxury of having a whole seat each to themselves to turn into beds and get more sleep as we travelled along the roads. It was imperative to have some allowance because one just never knew what tantrum the bus would throw along the way. On more than just a few occasions, the driver had to pull over by the roadside to do some running repairs. There was this one time when the bus just sort of refused to budge on the incline along Libis leading to Katipunan in Quezon City. We had an eight o’clock game at Ateneo de Manila; and were it not for the bus having one of its moments, we were actually no more than 10 or 15 minutes away from the venue. I think we were stuck there for about twenty minutes. I have never liked being late for anything, so I could not really help glancing at my watch every now and again. A good thing the driver was himself something of a mechanic. After what seemed like an eternal wait – and God knows how many Hail Marys – the engine came to life and we drove along. I think we got to the venue just as the grace period was about to expire. For all the trouble that the bus dealt us, though, I do not remember that there was any one occasion when it did not get us to and from a venue. There were delays yes; but we always got to where we were supposed to go and back! I believe there were those whose stories would say otherwise. I do not remember that the bus was ever given a name. If you are wondering why I call it the Good Luck Bus, the answer is really very simple.